Unionists and loyalists angered by the removal of the British Union Jack flag above Belfast City Hall are increasingly turning to violence and threats as their protests fail to deliver any progress. Road blockings have also resumed, although on a lesser scale to those seen prior to the Christmas and New Year period. Meanwhile, acts of sectarian violence and murder are being openly discussed by loyalists in public internet forums. The focus of the anger remains the cross-community Alliance Party, which holds the balance of power at Belfast City Hall and who backed the recent decision to reduce the number of days the Union flag flies above the city centre building. But the attentions of loyalist thugs are increasingly turning against nationalists. One loyalist web page openly carried calls to “shoot a few taigs [Catholics]”. On another page entitled ‘Loyalists Peaceful Protest Updater’ one individual spoke of shooting Catholics and planting pipe bombs. Another contributor called for the main Alliance Party office in east Belfast to be “smashed up”. Commentators have pointed to strong evidence of orchestration by unionist paramilitaries, possibly in collusion with elements in mainstream unionism. The unionist community now appears increasingly polarised, with many working-class unionists expressing extremist views and speaking of coming under a nationalist ‘siege’. The apparent ambivalence of the mainstream unionist parties, the DUP and UUP, is fuelling concerns of a potential return to serious loyalist violence. Last night saw the first serious riot since mid-December, when a mob of up to a 100 engaged in clashes with nationalists from the Short Strand area in east Belfast. Bricks and petrol bombs were thrown at nationalist homes on Mountpottinger Road, and loyalists later clashed with the PSNI police at Templemore Avenue. Police spokesmen later pointed to the stashes of petrol bombs and the use of wheelie-bins filled with missiles. “We had members of the UVF who were engaged in attacks on police... There’s absolutely no doubt this violence was orchestrated by the UVF,” said the chairman of the Police Federation, Terry Spence. There was also traffic disruption in south Belfast for a time during a loyalist protest on the Upper Malone Road in Belfast, and on Wednesday, in Carrickfergus, County Antrim. Other protests were due to take place this evening. While the main focus for the flag protestors is a rally set for Belfast city centre tomorrow [Saturday], plans are also under way for some 150 loyalists to stage a protest outside the Dublin parliament. The group will ask “sarcastically” for the Irish flag to be taken down, according to reports. Organiser Willie Frazer said that three busloads of protesters will make the journey for the hour-long protest outside Leinster House. Frazer was previously behind the disastrous 2006 ‘Love Ulster’ parade through Dublin city centre, when loyalists attempted to hold a sectarian march down O’Connell street. 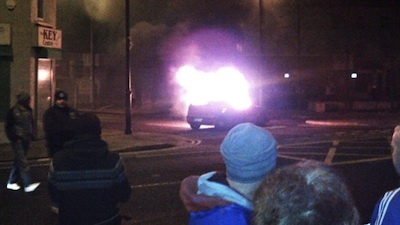 The event provoked one of Dublin’s most serious riots in decades.